Effective leaders possess a similar set of traits and characteristics. relatively stable characteristics such as abilities, psychological motives, or consistent patterns of behavior. Trait theory is also known as the “great person” theory because early versions of the theory stated that leaders are born, not made. In other words, you either have the right stuff to be a leader, or you don’t. And if you don’t, there is no way to get it. What are the 7 leadership traits? refers to high levels of effort and is characterized by achievement, motivation, initiative, energy, and tenacity. In terms of achievement and ambition, leaders always try to make improvements or achieve success in what they’re doing. They want to be in charge and think about ways to influence or convince others about what should or shouldn’t be done. Honesty, being truthful with others, is a cornerstone of leadership. Without it, leaders won’t be trusted. When leaders are honest, subordinates are willing to overlook other flaws. Integrity is the extent to which leaders do what they say they will do. Leaders may be honest and have good intentions, but if they don’t consistently deliver on what they promise, they won’t be trusted. believing in one’s abilities, also distinguishes leaders from nonleaders. Self confident leaders are more decisive and assertive and are more likely to gain others’ confidence. Moreover, self confident leaders will admit mistakes because they view them as learning opportunities rather than a refutation of their leadership capabilities. Even when things go wrong, they remain even tempered and consistent in their outlook and in the way they treat others. Leaders who can’t control their emotions, who become angry quickly or attack and blame others for mistakes, are unlikely to be trusted. Leaders are also smart. This doesn’t mean that leaders are necessarily geniuses far from it. But it does mean that leaders have the capacity to analyze large amounts of seemingly unrelated, complex information and see patterns, opportunities, or threats where others might not see them. Finally, leaders also know their stuff , which means they have superior technical knowledge about the businesses they run. Leaders who have a good knowledge of the business understand the key technological decisions and concerns facing their companies. More often than not, studies indicate that effective leaders have long, extensive experience in their industries. the degree to which a leader structures the roles of followers by setting goals, giving directions, setting deadlines, and assigning tasks. A leader’s ability to initiate structure primarily affects subordinates’ job performance. the extent to which a leader is friendly, approachable, and supportive and shows concern for employees. Consideration primarily affects subordinates’ job satisfaction. Blake and Mouton used two leadership behaviors, concern for people (i.e., consideration) and concern for production (i.e., initiating structure), to categorize five different leadership styles. Both behaviors are rated on a 9 point scale, with 1 representing “low” and 9 representing “high.” Blake and Mouton suggest that a “high high,” or 9, 9 leadership style is the best. They call this style team management because leaders who use it display a high concern for people (9) and a high concern for production (9). By contrast, leaders use a 9, 1 authority compliance leadership style when they have a high concern for production and a low concern for people. A 1, 9 country club style occurs when leaders care about having a friendly, enjoyable work environment but don’t really pay much attention to production or performance. 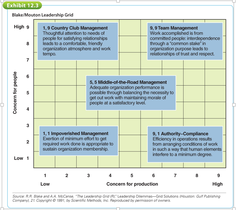 The worst leadership style, according to the grid, is the 1, 1 impoverished leader, who shows little concern for people or production and does the bare minimum needed to keep his or her job. Finally, the 5, 5 middle of the road style occurs when leaders show a moderate amount of concern for both people and production. Is the team management style, with a high concern for production and a high concern for people, the best leadership style? Logically, it would seem so. Why wouldn’t you want to show high concern for both people and production? Nonetheless, nearly 50 years of research indicates that there isn’t one best leadership style. The best leadership style depends on the situation. In other words, no one leadership behavior by itself and no one combination of leadership behaviors works well across all situations and employees. What are the 3 assumptions of Fiedler’s Contingency Theory? the first basic assumption of Fiedler’s theory is that leaders are effective when the work groups they lead perform well. So, instead of judging leaders’ effectiveness by what they do (i.e., initiating structure and consideration) or who they are (i.e., trait theory), Fiedler assesses leaders by the conduct and performance of the people they supervise. Second, Fiedler assumes that leaders are generally unable to change their leadership styles and that they will be more effective when their styles are matched to the proper situation. Third, Fiedler assumes that the favorableness of a situation for a leader depends on the degree to which the situation permits the leader to influence the behavior of group members. Fiedler’s third assumption is consistent with our definition of leadership as the process of influencing others to achieve group or organizational goals. In other words, in addition to traits, behaviors, and a favorable situation to match, leaders have to be allowed to lead. The degree to which a particular situation either permits or denies a leader the chance to influence the behavior of group members. What is the most important situational factor and define this? Leader member relations and refers to how well followers respect, trust, and like their leaders. When leader member relations are good, followers trust the leader and there is a friendly work atmosphere. the degree to which the requirements of a subordinate’s tasks are clearly specified. With highly structured tasks, employees have clear job responsibilities, goals, and procedures. the degree to which leaders are able to hire, fire, reward, and punish workers. The more influence leaders have over hiring, firing, rewards, and punishments, the greater their power. Relationship oriented leaders with high LPC scores were better leaders (i.e., their groups performed more effectively) under moderately favorable situations. In moderately favorable situations, the leader may be liked somewhat, tasks may be somewhat structured, and the leader may have some position power. In this situation, a relationship oriented leader improves leader member relations, which is the most important of the three situational factors. In turn, morale and performance improve. By contrast, as Exhibit 12.6 shows, task oriented leaders with low LPC scores are better leaders in highly favorable and unfavorable situations. Task oriented leaders do well in favorable situations where leaders are liked, tasks are structured, and the leader has the power to hire, fire, reward, and punish. In these favorable situations, task oriented leaders effectively step on the gas of a well tuned car. Their focus on performance sets the goal for the group, which then charges forward to meet it. But task oriented leaders also do well in unfavorable situations where leaders are disliked, tasks are unstructured, and the leader doesn’t have the power to hire, fire, reward, and punish. In these unfavorable situations, the task oriented leader sets goals, which focus attention on performance and clarify what needs to be done, thus overcoming low task structure. This is enough to jump start performance even if workers don’t like or trust the leader. People with moderate LPC scores, who can be somewhat relationship oriented or somewhat task oriented, tend to do fairly well in all situations because they can adapt their behavior. Typically, though, they don’t perform quite as well as relationship oriented or task oriented leaders whose leadership styles are well matched to the situation. be incapable of changing their leadership styles. Accurately measure and match leaders to situations. Teach leaders how to change situational favorableness by changing leader member relations, task structure, or positive power. A leadership theory that states that leaders can increase subordinate satisfaction and performance by clarifying and clearing the paths to goals and by increasing the number and kinds of rewards available for goal attainment. that leaders can change and adapt their leadership styles. Clarify paths to goals. Clear paths to goals by solving problems and removing roadblocks. Increase the number and kinds of rewards available for goal attainment. Do things that satisfy followers today or will lead to future rewards or satisfaction. Offer followers something unique and valuable beyond what they’re experiencing. can achieve organizational goals, take care of problems that prevent followers from achieving goals, and then find more and varied rewards to motivate followers to achieve those goals. First, leader behavior must be a source of immediate or future satisfaction for followers. The things you do as a leader must either please your followers today or lead to activities or rewards that will satisfy them in the future. Second, while providing the coaching, guidance, support, and rewards necessary for effective work performance, leader behaviors must complement and not duplicate the characteristics of followers’ work environments. Thus, leader behaviors must offer something unique and valuable to followers beyond what they’re already experiencing as they do their jobs or what they can already do for themselves. 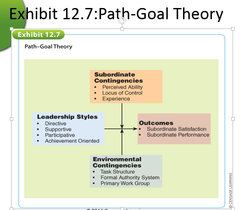 In contrast to Fiedler’s contingency theory, path goal theory assumes that leaders can change and adapt their leadership styles. involves being approachable and friendly to employees, showing concern for them and their welfare, treating them as equals, and creating a friendly climate. Supportive leadership is very similar to considerate leader behavior. Supportive leadership often results in employee satisfaction with the job and with leaders. This leadership style may also result in improved performance when it increases employee confidence, lowers employee job stress, or improves relations and trust between employees and leaders. involves consulting employees for their suggestions and input before making decisions. Participation in decision making should help followers understand which goals are most important and clarify the paths to accomplish them. Furthermore, when people participate in decisions, they become more committed to making them work. means setting challenging goals, having high expectations of employees, and displaying confidence that employees will assume responsibility and put forth extraordinary effort. simply how much ability subordinates believe they have for doing their jobs well. Subordinates who perceive that they have a great deal of ability will be dissatisfied with directive leader behaviors. Experienced employees are likely to react in a similar way. Since they already know how to do their jobs (or perceive that they do), they don’t need or want close supervision. By contrast, subordinates with little experience or little perceived ability will welcome directive leadership. Locus of control is a personality measure that indicates the extent to which people believe that they have control over what happens to them in life. Internals believe that what happens to them, good or bad, is largely a result of their choices and actions. Externals, on the other hand, believe that what happens to them is caused by external forces beyond their control. Accordingly, externals are much more comfortable with a directive leadership style, whereas internals greatly prefer a participative leadership style because they like to have a say in what goes on at work. the degree to which the requirements of a subordinate’s tasks are clearly specified. When task structure is low and tasks are unclear, directive leadership should be used because it complements the work environment. When task structure is high and tasks are clear, however, directive leadership is not needed because it duplicates what task structure provides. Alternatively, when tasks are stressful, frustrating, or dissatisfying, leaders should respond with supportive leadership. is an organization’s set of procedures, rules, and policies. When the formal authority system is unclear, directive leadership complements the situation by reducing uncertainty and increasing clarity. But when the formal authority system is clear, directive leadership is redundant and should not be used. group refers to the amount of work oriented participation or emotional support that is provided by an employee’s immediate work group. Participative leadership should be used when tasks are complex and there is little existing work oriented participation in the primary work group. When tasks are stressful, frustrating, or repetitive, supportive leadership is called for. People who work for supportive and directive leaders are more satisfied with their jobs and their bosses. Hersey and Blanchard’s Situational Leadership Theory takes into consideration what 2 things? idea of follower readiness. They argue that employees have different levels of readiness for handling different jobs, responsibilities, and work assignments. Accordingly, Hersey and Blanchard’s situational theory states that leaders need to adjust their leadership styles to match followers’ readiness. The ability and willingness to take responsibility for directing one’s behavior at work. consists of the amount of knowledge, skill, ability, and experience people have to perform their jobs. As you would expect, people with greater skill, ability, and experience do a better job of supervising their own work. is a feeling of self confidence or self respect. Confident people are better at guiding their own work than insecure people are. leadership style in terms of task behavior and relationship behavior. (high task behavior and low relationship behavior) is based on one way communication in which followers are told what, how, when, and where to do particular tasks. Telling is used when people are at the R1 stage. For instance, someone using a telling leadership style would identify all the steps in a project and give explicit instructions on exactly how to execute each one. (low task behavior and high relationship behavior) is based on two way communication and shared decision making. Participating is used with employees at R3. Since the problem is with motivation rather than ability, someone using a participating leadership style might solicit ideas from a subordinate about a project and let the subordinate get started but ask to review progress along the way. those styles vary from autocratic decisions (AI or AII) on the left, in which leaders make the decisions by themselves, to consultative decisions (CI or CII), in which leaders share problems with subordinates but still make the decisions themselves, to group decisions (GII) on the right, in which leaders share the problems with subordinates and then have the group make the decisions. (also known as the Vroom Yetton Jago Model) helps leaders decide how much employee participation (from none to letting employees make the entire decision) should be used when making decisions. instead specifies five different decision styles or ways of making decisions. As shown in this slide, those styles vary from autocratic decisions (AI or AII), in which leaders make the decisions by themselves, to consultative decisions (CI or CII), in which leaders share problems with subordinates but still make the decisions themselves, to group decisions (GII), in which leaders share the problems with subordinates and then have the group make the decisions. improves the quality of decisions and the extent to which employees accept and are committed to decisions. If the quality of the decision is important and if the leader doesn’t have enough information to make the decision on his or her own, then don’t use an autocratic decision style. If having subordinates accept the decision is important and critical to successful implementation and subordinates are likely to disagree or end up in conflict over the decision, then don’t use an autocratic or consultative decision style. If having subordinates accept the decision is absolutely required for successful implementation and subordinates share the organization’s goals, then don’t use an autocratic or consultative style. the ability to anticipate, envision, maintain flexibility, think strategically, and work with others to initiate changes that will create a positive future for an organization. For example, every dollar invested in Walgreen’s over the last 25 years would be worth twice as much as a dollar invested in Intel, and five times as much as a dollar invested in GE. CEO Charles Walgreen III transformed the company by focusing Walgreen’s managers and employees on the strategic objective of “providing the best drugstore service in America.” Not once did Mr. Walgreen point to himself as a key factor, preferring instead to credit the great people he had on his team.Thus, strategic leadership captures how leaders inspire their followers to change and to give extraordinary effort to accomplish organizational goals. creates a positive image of the future that motivates organizational members and provides direction for future planning and goal setting. The behavioral tendencies and personal characteristics of leaders that create an exceptionally strong relationship with followers. What do charismatic leaders do? articulate a clear vision for the future that is based on strongly held values or morals. model those values by acting in a way consistent with the vision. communicate high performance expectations to followers. display confidence in followers’ abilities to achieve the vision. provide developmental opportunities for followers, are open to positive and negative feedback, recognize others’ contributions, share information, and have moral standards that emphasize the larger interests of the group, organization, or society. Ethical charismatics produce stronger commitment, higher satisfaction, more effort, better performance, and greater trust. Generates awareness and acceptance of a group’s purpose and mission and gets employees to see beyond their own needs and self interests for the good of the group. means that transformational leaders motivate and inspire followers by providing meaning and challenge to their work. means that transformational leaders encourage followers to be creative and innovative, to question assumptions, and to look at problems and situations in new ways even if their ideas are different from the leaders. means that transformational leaders pay special attention to followers’ individual needs by creating learning opportunities, accepting and tolerating individual differences, encouraging two way communication, and being good listeners.